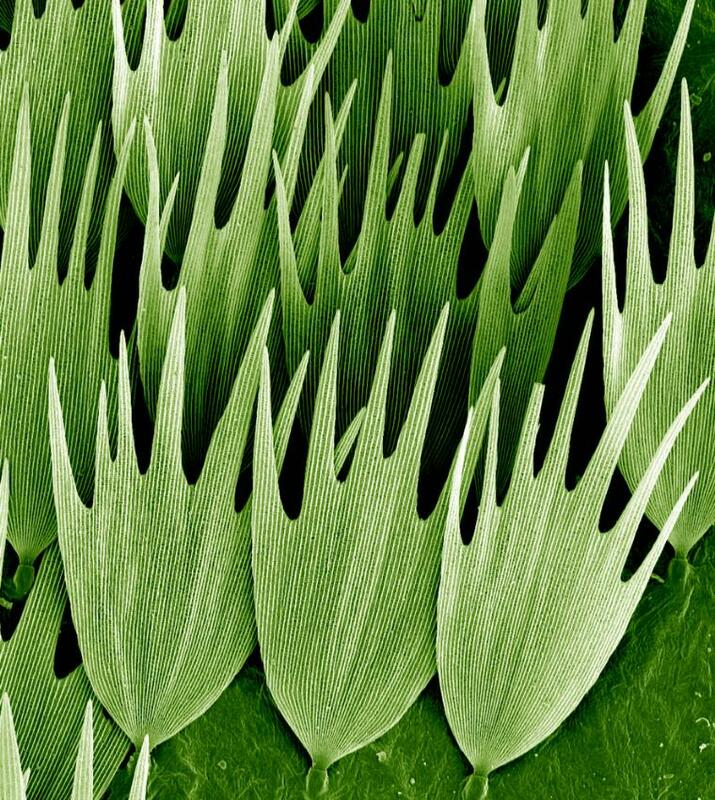 Scanning electron micrograph of the scales on the wing of a Madagascan moon moth, Argema mittrei. This endangered moth is from the order Lepidoptera and is also known as the Comet moth, because of its characteristic long tail. The tail span is 15 cm and wing span 20 cm, making it one of the world's largest silk moths. Scales are found on the wings of butterflies and moths in the Lepidoptera order, producing their distinctive colours. In fact, Lepidoptera means 'scaly-winged'. The moon moth also has no mouth parts; all feeding is done during its caterpillar stage, which means it only lives for ten days. Scanning electron micrographs are created in black and white, and are given a false colour after they have been imaged. Creator Kevin MacKenzie has coloured the scales in this micrograph light green to reflect the natural colour of the moth. 2011 Wellcome Image Award winner. Wellcome Image Awards 2011.